Sharp-shinned Hawks--called "Sharpies" by birders--are small, very agile hawks that belong to a genus of birds called accipiters. Sharpies are about the size of a blue jay. These little hawks prefer forests, parks, and the wilder areas, but on occasion can be seen in backyards. 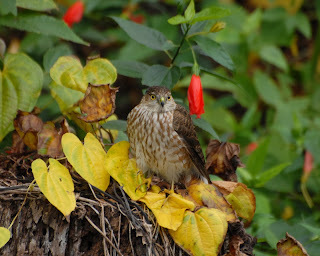 Differentiating these little accipiters from Cooper's Hawks--another accipiter--is one of the challenges of birding. They look very much alike. 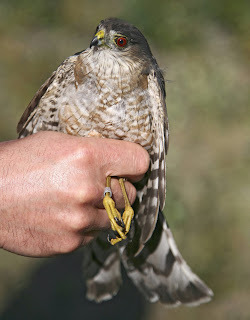 Sharp-shinned Hawk in hand. Note the thin, long toes on the Sharpie and the small head. The picture above gives you an idea of the size. These are not large raptors. 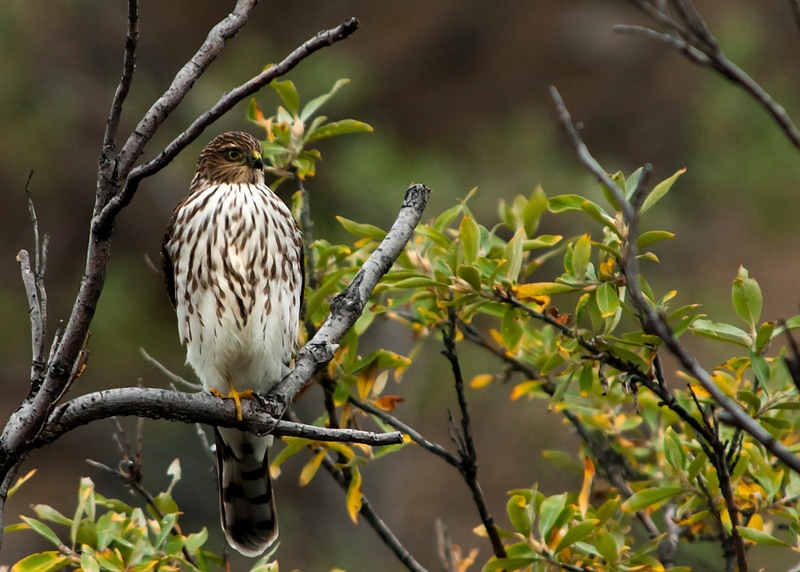 Sharp-shinned are smaller than Cooper's Hawks, but there is almost an overlap in size. The difference in male and female raptors is generally the size. The female is larger than the male. 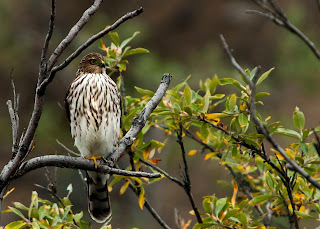 So the larger female Sharp-shinned Hawk may be very similar in size to a smaller male Cooper's Hawk. There is a bigger difference in the size of male and female Sharpies than any other species of raptor. Birds of North America quotes a study by Snyder and Wiley (1976) that found male Sharpies on the average have only about 57% of the body mass of a female Sharpie. Notice how the widest part is at the shoulders. It has a kind of body-builder or Dolly Parton look to it. A Sharpie is a bit chesty. Also, note the hooded look. The Sharpie has a dark crown. The dark color continues down the nape of the neck down onto its back. This is different than the smaller cap on the larger and flatter head of the Cooper's Hawks. The Sharpie's head is rounder than the Cooper's. In addition, the Cooper's has a kind of a messy, crest-like feather thing going on at the back of its head that is visible on occasion. The Sharpie has no crest-like feathers on its head. Juvenile Sharp-shinned Hawk--Wikicommons--juveniles have yellow eyes. Photographer--Matt edmonds. Even this juvenile Sharpie above has the high chest, and small head. 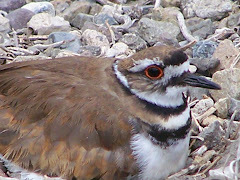 The chest being wider at the shoulder is harder to see here on this juvenile Sharpie above, but the very thin toes with the long center toe are evident. Note the small head, rounded wings, and straight tail tip with the notch on the Sharpie above. In Orange County, CA, we usually see Sharpies in migration season which is fall and a bit into winter. They migrate alone or in small groups. Occasionally with other species of hawks. Sharpies tend to migrate along areas where they would most likely live and hunt: forests and areas with conifers. 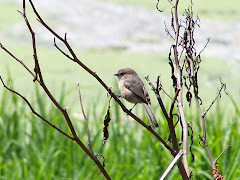 The long, slim tail and the rounded wings help the Sharpie maneuver in tight spots like forested areas and undergrowth. 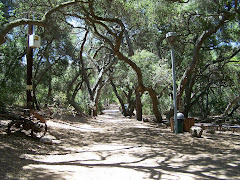 I was once in the nature center at Mile Square Park in Fountain Valley and was startled by a small Sharpie, probably a male, flying fast and low to the ground along a curving trail between the bushes. He flashed by me and straight into the undergrowth like he was shot out of a canon. 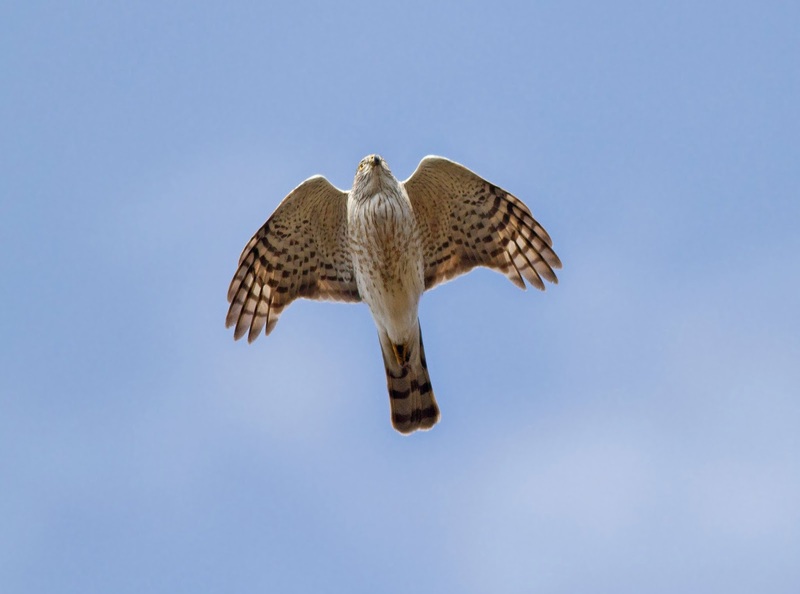 He seemed incredibly small, but there was no doubt at all that he was a very small accipiter based on the shape and the coloring. Smithsonian Migratory Bird Center video by George Jameson. Note the long middle toe, the hooded appearance, and the large eyes, and how the chest is largest at the shoulders. Note that the eyes are not yet red, and so this is a juvenile Sharpie. Sharp-shinned Hawks are the stealth bombers of the bird world. Any place, any time is right for a surprise attack. 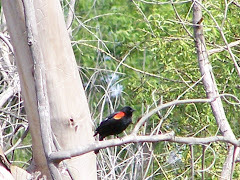 They can begin an attack from a concealed perch in a tree or shrub, or on the wing. And their prey can be perched or on the wing as well. When opportunity strikes, the Sharpie strikes, and holds tight with its dainty, but long, deadly talons. The Sharpie attacks in a horizontal plane, not a vertical one. It approaches fast through the foliage toward its unsuspecting prey. It either succeeds, or it moves on quickly to another target. Birds are its most frequent victim by far, but it also takes a small amount of mammals, reptiles, insects, and amphibians. Hooded appearance--black on the head continues down the back. Thin toes. Long middle toe. A very thin, white tip on the end of its slim, squared tail. From the Smithsonian Migratory Bird Center. Check out those field marks. To be ready to identify Sharpies and Coopers Hawks, I would suggest you study your bird guide and the articles listed in the "Resources and Links" section at the end of this post. Good birders learn to recognize bird species the way you would recognize an old friend--repeated encounters. We begin to recognize the color, the size, the shape, the way they move and behave, and their voice. Even their favorite foods and hangouts. Make friends with Sharpies by observing and studying them both in real life, and in bird guides, photographs, and videos. So when you encounter an accipiter, be prepared. Know your Sharpies. Know your Coopers. And then do your best. It is a challenging ID. Have fun birding in Orange County, California! Article about differentiating Coopers and Sharpies. A Sharp-shinned Species profile from Cornell's all About Birds. Lots of detail in their profile about Sharpies. Great resource. Article addresses Sharp-shinned, Cooper's Hawks, and Goshawks. Lots of details and pictures. Profile with an ID gallery of photos. Great shot of a Sharpie. Also check out their Ground-hunting Sharp-shinned Hawk. Great collection of bird videos. Watch the videos of the sharpies. Get a feel for them. Sharp-shinned Hawk gets a bath after getting glue from a glue trap stuck in its feathers. Gives a good idea of the size. Videos of Sharp-shinned Hawks from the Macauley Library. Mango Verde page about the Sharp-shinned Hawk. Detailed information regarding Sharp-shinned Hawks including sketches. Sharp-shinned Hawk visits. Nice shots and video. 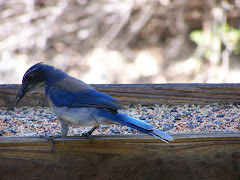 Great post about a Sharpie visiting a backyard in Oregon. Excellent pictures. Note the widest part of the breast is at the shoulders. And the hooded appearance. Detailed guide to telling the two similar accipiters apart. 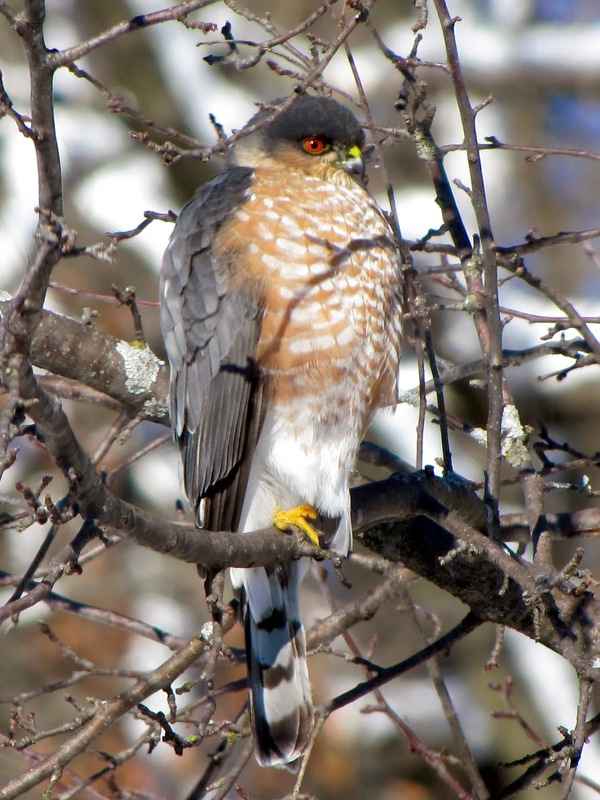 Brief article by Pat Brennan about the influx of Sharp-shinned Hawks during migration. Article about the Christmas Count. Good picture of a Sharpie in Laguna Woods. Good Sharp-shinned Hawk article and gallery. Profile of Sharp-shinned Hawks. Photos. 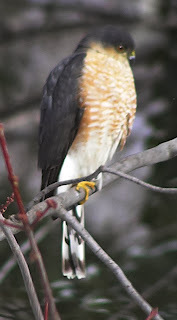 Here is a search on Vimeo for Sharp-shinned Hawk videos. Usually high quality. Look especially for Don Desjardin videos. His videos are excellent, and he knows his birds. 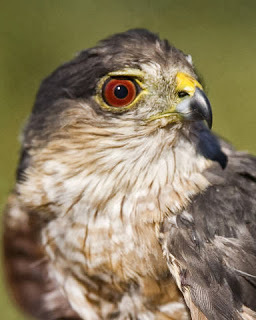 Gallery of Sharp-shinned Hawks, Cooper's Hawks, and Goshawks. All in flight. Mature Brown Pelican in breeding plumage perched on the footbridge at Bolsa Chica Ecological Reserve. Orange County has two species of Pelicans: Brown Pelicans which prefer the ocean and saltwater environments, and American White Pelicans which prefer fresh water environments. They are not hard to tell apart. During Fall and Winter you will find American White Pelicans in large bodies of water, and sporadically in small, or even tiny neighborhood parks. As long as there is a body of water with fish, and they can fit in it, American White Pelicans will visit it. Brown Pelicans with the spectacular dives from high above the water usually need much larger bodies of water. The Brown Pelican and the American White Pelican both show up in mixed saltwater and freshwater environments like Upper Newport Bay and Bolsa Chica. But you will also find both in the large ponds at San Joaquin Wildlife Sanctuary which is not far from Upper Newport Bay. If you go far inland, any pelican you see will most likely be an American White Pelican. However, both American White Pelicans and Brown Pelicans can also be found at the Salton Sea. American White Pelicans, Brown Pelicans, Double-Crested Cormorant, and two American Coots. The gray bird in the water and the brown bird on the far right are both Brown Pelicans resting at San Joaquin Wildlife Sanctuary. Pelicans are often found hanging out with cormorants and other birds. The first thing you notice in the picture above is how much bigger the American White Pelican is than the Brown Pelicans. The Brown Pelican is large at 50" long with an 84-inch wingspan. Yet as big as the Brown Pelican is, the American White Pelican is even bigger at 62" long with a 105" wingspan. When you see them standing close together, it is plain which is which. Immature Brown Pelicans on the left. Mature Brown Pelican on the right. While I have seen Brown Pelicans perch on wooden railings, fences, posts, and even street lights. I have never seen the huge American White Pelican perch on anything so flimsy. Mostly their feet are on solid ground when they are not swimming. And while you will often find a lone Brown Pelican perched or sitting down on the ground near water, you will most often find that American White Pelicans gather in groups on the shore of a lake or on a sand bar in an estuary. They fish in groups, fly in groups, and hang out together in groups. American White Pelicans are just more gregarious than Brown Pelicans. The American White Pelican is all white except for black primaries and wing tips which are mostly seen in flight. Mostly when they swim, they appear all white. Brown Pelicans favor salt water and estuaries with mixed water. American White Pelicans prefer fresh water or estuaries. American White Pelicans, heads down, scooping up some fish. The foraging techniques of American White Pelicans and Brown Pelicans are so different that if you only saw them foraging and did not see their plumage, you would know which species you were observing. The American White Pelican swims on the surface of the water and sticks its head down like a dabbling duck to scoop up fish. It often forages in groups that can reach over 5o individuals. American White Pelicans fishing together look like synchronized swimmers as they swim, stick their heads in the water and come up all at the same time. It is something to watch. I have seen non-birders stand mesmerized at the sight of a large synchronized group of American White Pelicans feeding. I have had amazed park goers ask me, "What are they doing?" They can put on quite a show. American White Pelicans fishing cooperatively. Brown Pelican about to dive down into the waters of Bolsa Chica Ecological Reserve for a catch of fresh fish. You will never see an American White Pelican fish this way. Brown Pelicans fly up and dive into the water scooping up fish as they hit the water. Sometimes, they do not fly high at all, but at other times they fly high above the water and splash down into the fish. Although they may fish with other Brown Pelicans, it is every bird for itself. Their strong power dive stuns the fish they then scoop up. Their dramatic, aeronautical style of fishing attracts as much attention as the synchronized swimming of the American White Pelicans. Immature Brown Pelican with a pouch full of fish. Two mature Brown Pelicans take off for another round of fishing. Brown Pelican bomb-dives into the water. Brown Pelicans can be seen bomb diving the water by the Bolsa Chica footbridge most frequently in Fall and Winter. Parents and their kids and photographers and the cameras stand on the bridge just watching and snapping pictures as the Brown Pelicans fly up and splash into the water over and over again. American White Pelicans soar high in the air sometimes, flying long distances to feeding areas. These American White Pelicans are soaring over San Joaquin Wildlife Sanctuary--a very common sight. American White Pelicans usually fly in a "V"" or a "J" formation. And they fly in groups--sometimes quite far to obtain food. They soar high in the air where their white body with black tipped wings are sometimes mistaken by non-birders for gulls. It isn't uncommon to see American White Pelicans flying overhead in Southern California even in the San Bernardino Mountains. Because they fly so high overhead, these huge birds can look seem like a much smaller bird flying much lower. Sort of an optical illusion. So when you see white birds flying in formation overhead, take another look. You may be looking at American White Pelicans. They soar on thermals, and it is not unusual to see them circling and higher and higher before heading out for their destination. Mature Brown Pelican flying low over the water at Bolsa Chica Ecological Reserve moves up slightly to cross the footbridge. In groups or alone Brown Pelicans can be seen flying low over the ocean waves or over the water in an estuary. They are often seen flying in lines low over the ocean. Sometimes you may see them flying in a V formation. They do not soar at high altitudes. The American White Pelican is present in Orange County in very small numbers in scattered locations all year. They increase in numbers in the Fall and Winter. Seeing a lone American White Pelican or two is unusual, but not unheard of at any time of year in Orange County. During Fall and Winter, the population significantly swells with wintering American White Pelicans. It is during Fall and Winter that large groups of American White Pelicans are often spotted. The Brown Pelican population also increases in Orange County during Fall and Winter, but individuals and small groups of Brown Pelicans are present all year and more frequently seen than the American White Pelican. You can find American White Pelicans in any large or small body of fresh water in the Fall and Winter. Any park with a stocked lake no matter how small can become a fishing hole for the American White Pelican. So large regional parks like Mile Square Park and small neighborhood parks like Carr Park or the even smaller Greer Park can sporadically host a meal for a group of American White Pelicans. Other than Fall and Winter, American White Pelicans are hard to find in the OC. So the next time you see a pelican in Orange County, observe the size, the coloring, the feeding techniques, and the flying style. You will be able to easily identify the species of pelican you are seeing. Have fun birding in Orange County, California. Large ecological reserve on Pacific Coast Highway. Old hunting club belonging to the IRWD and the Sea and Sage Audubon Headquarters. Salt water environments and estuaries. These are coastal birds flying low over the waves. Drive up and down the coast and you will see them most of the year in varying numbers. Fall and winter see the numbers swell with migrants. Large park bisected by Goldenwest. Irvine Park with a large lake. Small neighborhood park with a lake. Neighborhood park that is cut in two pieces by McFadden. The small , southern section has a lake that is frequented by ducks, geese, egrets, herons, gulls, white-faced ibises, and rarities that show up from time to time. On occasion, the lake is visited in Fall and Winter by American White Pelicans. Regional park with a large, stocked lake. Upper Newport Bay Ecological Preserve is an estuary where salt and fresh water mix as the tides flow in and out. Snow Goose has dark eyes, pinkish bill, and a prominent black "grin patch." Snow Geese are rare, but they are regularly seen in Orange County because California and thus Orange County are on the migration route to their Canadian breeding grounds. With the hungry, gluttonous ducks and coots feeding on handouts. Kind of makes me sad. Snow Geese are often seen in groups, but in the OC we often see then alone or with a few other Snow Geese. Snow Goose swimming in a lake in a small neighborhood park. Notice the black wing tips. Notice the tint on the head. What're you looking at? Notice the yellowish coloring tinting the face. Notice the very prominent black grin patch. Larger Domestic Goose--Large, with Orange legs and bill. Notice the large looking belly. The Snow Goose would be smaller and have a smaller belly. All white wings. Orange eye ring, smaller light-colored grin patch. All white. The Snow Goose has no orange eye ring, dark eyes, and a pink bill with a black grin patch. Unlike the dark-eyed Snow Goose, the domestic goose has blue eyes. Here, a Ross's Goose hangs out in a San Fernando Valley park with other geese. Notice he has the same coloring as the Snow Goose, but the Ross's Goose is much smaller. The Ross's Goose has no tinting on the head or neck. Whiter overall head and neck than the Snow Goose. The bill is much smaller proportionally than the Snow Goose, and can show a bit of green coloring at the base. The Ross's Goose may have a much smaller and less obvious grin patch. The Snow Goose has a larger bill compared to the Ross's Goose, and a large, dark grin patch. Unlike the domestic goose, the Snow Goose has dark eyes vs. the domestic's blue eyes. The Snow Goose black wing tips unlike the white wings of the domestic goose. The Snow Goose has a pink bill and legs unlike the orange bill and legs of the domestic goose. Detailed page about the Snow Goose. Although it is multiplying, it is still a rare bird in Orange County. Read all about the Snow Goose. Detailed page about the Ross's Goose. Rare in Orange County. From Cornell. Some confusing geese. Read more about Snow Geese. Do Male Mallards Disappear in the Summer? Mallard drake in flashy breeding plumage which he wears most of the year. Notice the curl in his tail--although it is another sign you are looking at a drake--the curl often disappears during molting. The Mallard hen is brownish with an orange bill with black markings. Group of summer Mallards. Where are the drakes? I was recently out birding, and another park goer and I began chatting. When she found out I was a birder, she said she was perplexed about something. She wondered were all the male Mallards had gone. The only Mallards she seemed to see where groups of females. I am frequently asked about the disappearance of Mallard males or drakes in the late summer months. And it is true that if you look quickly at a group of Mallards at this time of year, it does seem that all the drakes have disappeared. But the answer is simple. The drakes are still there, but incognito. They are sporting what is called eclipse plumage. During the summer after breeding season, drakes molt and drop their worn breeding plumage. Their flashy feathers are temporarily replaced by drab, brown feathers that are very like, but not identical to the Mallard hen's usual plumage. However, there are still small, but obvious differences between Mallard hens and drakes. You can still spot the difference by observing the color of the bill and sometimes, but not always by a bit of green color still on the head of the drake. And if it hasn't been dropped in the molt, you may spot the curly tail feathers of the drake. Male Mallard or drake in eclipse plumage. Note the yellowish bill . The drake's breast is also a little warmer in color. It is also a different pattern. But it is the bill that stands out once you know the key. The drake's yellow bill is always the same regardless of the change in plumage. Although difficult to see in the picture above, the drake's bill has a small dot of black on the very tip. Take a look at this hen in the picture above. Female Mallard or hen--note the black and orange bill. The hens in both pictures are a patterned, dull brown in color Notice that their bills are orange with a bit of black scattered over the top. Some have a lot of black, and some have less, but all have orange and black on their bill. So take a second look at that group of Mallards shown above. I think you will find it is actually a co-ed group. It won't be long before the drakes are sporting fresh, brilliant breeding plumage. Male Mallard in the foreground. Female Mallards in the background and left. It is a subtle, but obvious difference. Once you know the difference, you will have little difficulty telling a Mallard drake from a hen. Male Mallard aka drake on the left. Female Mallard aka hen on the right. Have a great time birding in Orange County! My post all about Mallards, their appearance, habits, and oddities. My post showing wild ducks in Orange County and links to posts about them. Do you ever see truly strange-looking ducks around the parks and wildlife areas of Orange County? See if this post explains what you are seeing. Are confused by these two species? Especially the females? Check out my post on telling the difference between Wood Ducks and Mandarin Ducks. Red-tailed Hawks have many morphs or variations in appearance. Mature Red-tailed Hawk in flight shows "red" tail, patagial bar and a faint belly band. Red-tailed Hawk flying with no red tail showing. Belly band and patagial bar on the leading edge of wings are easy to see. The same Red-tailed Hawk flying with the sun behind him or her, clearly shows a red tail and the patagial bar on the leading a edge of the wing, but the belly band is not so easy to see. Mature Red-tailed Hawk perched on a cliff at Upper Newport Bay--Note how the long wings almost hide the red tail which is barely visible between his two long wings. Red-tailed Hawk taken by me during a raptor show. Mature Red-tailed Hawk with prey at Mile Square Regional Park. I took this shot at the lake without the island at Mile Square Regional Park just about an hour before sunset. This Red-tailed Hawk had just killed a duck. Red-tailed Hawks are very strong. It actually grabbed the duck in its talons and and flew off with it. Its red tail is barely visible here--hidden under the long wings. The feathers visible from underneath appear cream colored which is common. From the top or from below with the light shining through, the feathers appear reddish. 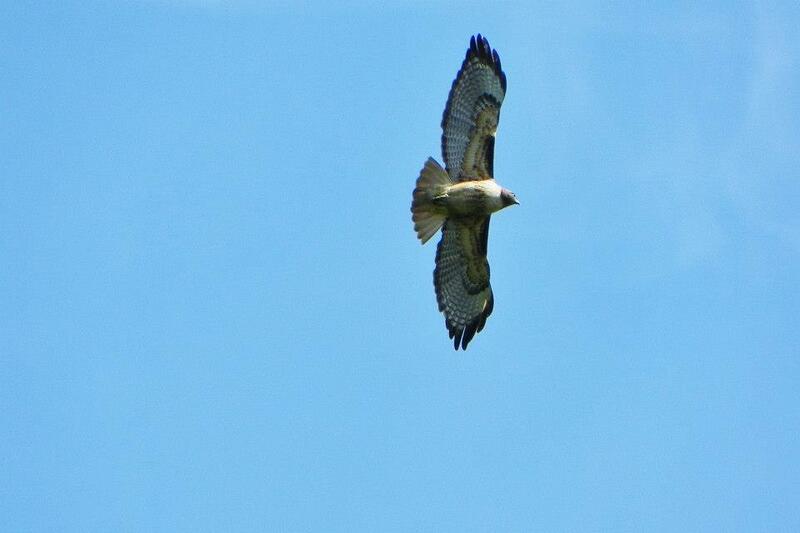 The hawk shown above is much more of a ruddy brown rather than a chocolate brown or a dull brown seen in others. It might just be a trick of lighting in the late afternoon. Lighting can change a lot. Red-tailed Hawk at Upper Newport Bay near the Muth Interpretive Center at Upper Newport Bay. Red-tailed Hawk have some of the most variable plumage of all bird species. Immatures and some color phases do not show the "red" tail. 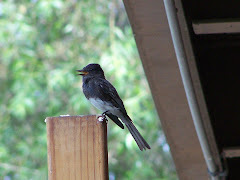 When perched or sitting on the ground, their long wings can partially or completely hide their "red" tail. In varying light, mature hawks with a red-tail may show no red tail due to whether or not the light is shining through their tails. This Red-tailed Hawk was injured and lost part of her right wing, but see how long the left wing is? That is one of the traits of the buteo that allow it to soar. Wide, long wings. The wing comes down to the end of the tail. Notice, too that the light markings on the back form a "V." That is typical of Red-tails. Light morph Krider's Red-tailed Hawk Courtesy US Fish and Wildlife Service. Photographer Dave Menke. Red-tailed Hawk courtesy US Fish and Wildlife Service. Photographer Mark Bohn. Red-tailed Hawks can be dark-chocolate, rufous, light brown with lots of white on the breast. Some are even mostly white and very dark brown looking very like an Osprey. The black bar on leading edge of the wings called the patagial bar and the "dark belly band are the more diagnostic field marks across almost all color phases. 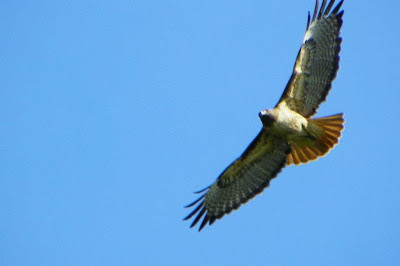 The Great Plains race of light colored Red-Tails called Krider's has the patagial bar, but not the belly band. Check out A Study of Krider's Red-tailed Hawk by the American Association. I have never heard of a Krider's sighting in Orange County, CA. 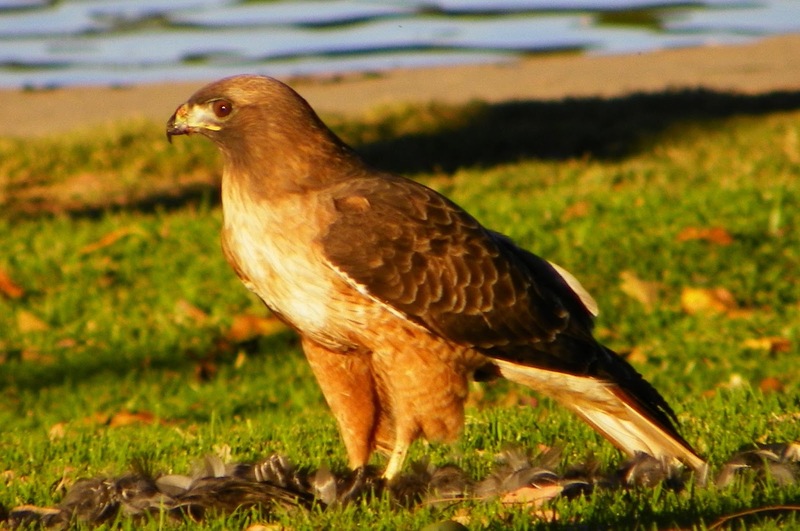 Red-tailed Hawks in Orange County tend to be the standard Red-tailed Hawk with some slightly lighter and some slightly darker, but no extremes. Again, Red-tailed Hawk have some of the most variable plumage in the avian world. They can frequently be seen on lamp lights near streets and freeway exits and entrances as well as in open country and in parks. 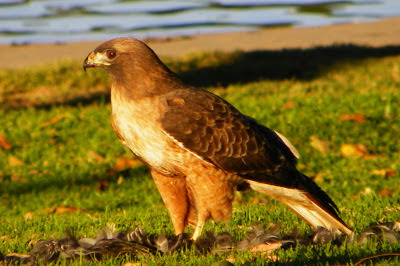 Red-tailed Hawks are very common in Orange County.